Last week we had a couple of technical glitches. The mail out function, didn’t, until I tried it again on Saturday afternoon and the picture of the two different hydrangeas was replaced by an old picture of Incrediball. Here it is Sunday and I’m trying to squeeze something in. I’m actually in Pittsburgh at our annual Garden Writer’s symposium. They are more of a forced march than anything approaching a holiday. We have been touring gardens since 6:00 am this morning and we get a short break before an afternoon of lectures. I’ve left the Assistant Gardener at home to look after the garden and try to water all the containers and eat all the Tomatoes. 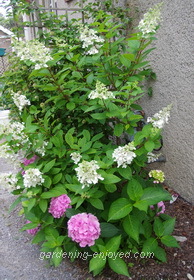 Here is the picture of the two hydrangeas that you should have received last week. Spent this morning at the wonderful Phipps’ Conservatory wandering its many greenhouses and outside gardens. 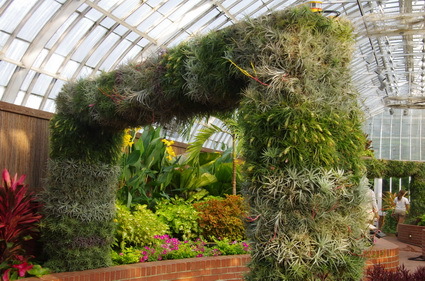 They had these two huge arches completely covered in various Tillandsia species. Will get back to a full Dallying next week and tell you much more about the gardens I have seen.